Best Sport Sandals: Do They Make a Difference? Yes They Do! You have to agree with us that it is very important for a sandal to have the design which you love and enjoy showing off with. However, if you are planning on hiking several miles a day, the comfortableness is the part which you should focus on, right? The length of the foot, type of fingers, and the wideness of the foot are all factors which you need to consider when shopping for sandals. A high quality sandal is one which you should buy only once in several years and it would provide you the support for at least several hours of comfortable walking in a day. Your sport sandals should make the walking easy and the standing as well. They should not distract you from your adventure, but they should support you in your daily activities. For this reason, and in order to save you some time for doing a research on your own, we decided on writing this buying guide which would guide you through the process of choosing the best sport sandals for you. It will provide you with all the necessary information and teach you which information you should value and which ones to ignore. By reading it, you will be able to choose the sandals with the most suitable features for your trip without spending a penny more than you should! Although sandals are not usually considered as a product which has many features and is hard to choose from, in fact it might be harder than many other products. 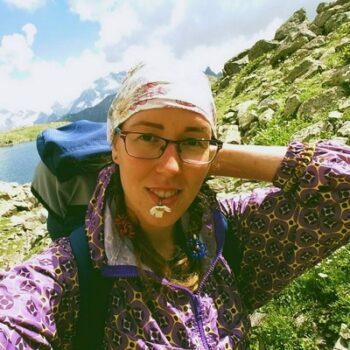 The sandals suggestions presented below are high quality sandals, which are intended for people who enjoy walking and they are having a long hiking trip ahead of them. For those of you who are just looking for, the pool and beach sandals, we have the perfect solutions as well. However, before selecting your sandals for sport, make sure you read the features to consider part, in order to get the main idea of what you are looking for. The sole is the most important thing when choosing a sport sandal. It is the core of the shoe and you should definitely be picky when it comes to this feature. However, you should keep in mind that most sport sandal soles are made of rubber material. The only difference between them is the inclination and the height of the heel. This is also very important to consider even though it sounds only as a design feature. The heel height decides whether your sandals would be comfortable and suitable for rocky terrains or softer terrains. Although there are some shock absorption technologies, the main rule is that if you want to hike on a rocky and firm terrain such as concrete, you should choose a sandal with a higher heel. 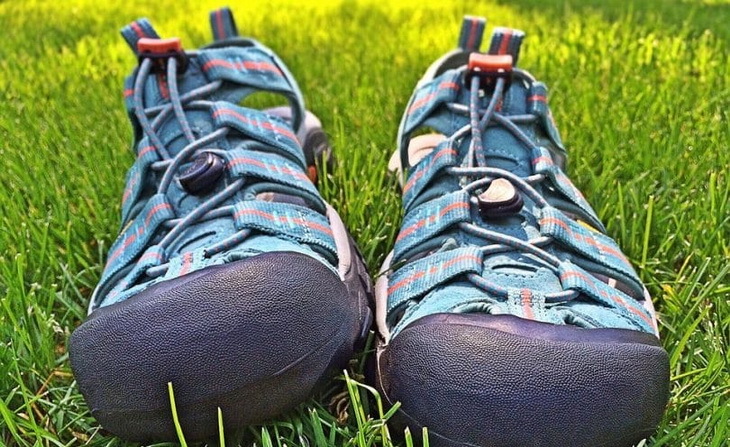 If you are planning on hiking on grass or ground, you could also use a lower heel. The foot bed is what makes the sandals comfortable or not for wearing. It is the part which is put on the top of the sole and it is providing support to your foot. The foot bed could be made with different kinds of materials, although the foam materials are most comfortable. However, they tend to smell, so if your feet also tend to smell, avoid these kinds of foot beds. There are also foot beds with massaging properties, which are something everyone should try and love. Besides their comfortableness, they provide a health benefits for the body. There are different types of closure systems depending on the manufacturer and the design of the sandal. However, it is recommended that you choose sandals which can be customized to your foot. Otherwise, you might end up with a product which is too wide or too tight for your foot. Even though it might be comfortable at first, they might still loosen up. So, strap closure system for slip sandals is a must and they are also very comfortable for hiking shoes as well. The hook and loop closure is comfortable and durable closure system as well with one note to remember. A buckle system which is placed near your ankle is probably not a good idea since it might irritate the spot. However, a buckle mechanism for the rest of the foot is the perfect solution. If you are looking for sandals you are probably looking for open type of shoes. However, before proceeding to the review part you should consider how open you want them to be. More open sandals provide better breathability, but your feet are also more subjected to bacteria and fungus infections. The closed type is suitable for long hikes and adventure trips, which require walking the whole day, but they are not always suitable for the beach for instance. All in all, the first thing you should consider is which type of sandal design you are looking for and where are you going to use them. After this, just choose your required features and you will probably end up with the best sport sandals for your needs. These sandal suggestions are all high quality designs, with excellent features intended for different types of people. Feel free to choose your best option after considering your favorite features and your personal requirements. Description: If you are looking for sandals combined with hiking shoes Keen Arroyo II Sandal is the right choice for you. They are comfortable and with open ventilation in order to provide the user maximum breathability. The side vents also add to their breathability properties, which makes these shoes perfect for warm weather conditions when your feet tend to release more heat. The Arroyo was previously called Taos, as some of the previous users might recall this hybrid design. The numbers are exact so they fit very nicely. The laces however, are a bit thin, and there is a great probability that you might need to replace them after a while. Another downside of the laces is that they are not elastic. The fabric, on the other hand, has a much better quality than the laces. If you change them with elastic ones, these shoes are the perfect match for every hiker. The fabric is coated with lather which makes the perfect design for an outside shoe. The sole is completely made out of rubber. The toe cap is also made out of rubber so in case you are planning on hiking in a muddy area or the terrain is humid, these shoes would help your toes stay dry. The lining is a hydrophobic mesh which is promoting their breathability properties. The footbed is also very comfortable with the metatomical dual density material, which is removable. This is a very useful characteristic since it needs to be washed from time to time in order to keep the bacteria away from your feet. The heel measures around 2’’ which is the recommended weight for a heel. The height provides you enough support so that you don’t feel the hard surfaces and it allows you to hike in rocky terrains as well. There is also a rear pool up loop which as every sport shoes user knows, is a very practical feature we all could live without, but it is sure nice to enjoy. Related: If you are hiking in your sandals, you might need some cord to help you get around certain areas. If you need a paracord, the Paracord Planet 325 3 Grade Paracord is a 3-strand and comes in many colors for a low price! 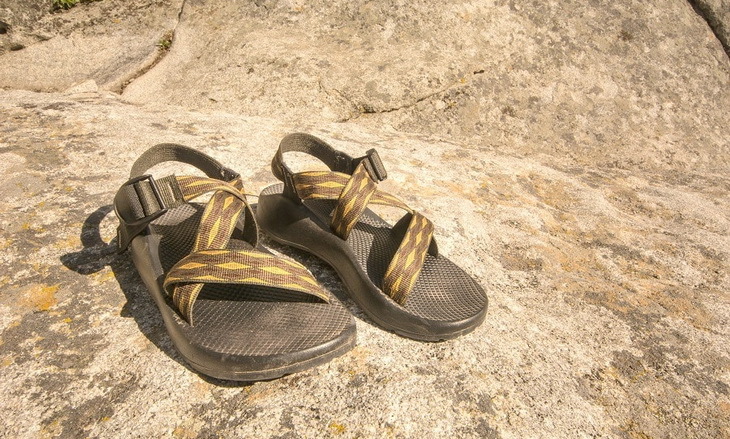 Description: This is a typical sandal design made especially for hiking on long destinations. It is clearly not made for hiking in the woods. However, the grass free areas are perfect for the Chaco Z2 Yampa Sandals. They are completely open, which is why it is not recommended for people who plan on hiking in grassy terrains where there is a danger from snakes or some insects. The fabric part is made of polyester and they have a buckle closure mechanism. Although this kind of mechanism is very convenient and easy to use, even kids could use it; it becomes unpractical after a while. After a while, this kind of mechanism could loosen up and get hard or impossible to use. And it is much harder to fix it. It is not like changing the laces for instance. The support, however, is top of the notch quality and the cushioning will make every hour of walking very comfortable. This footbed will provide your foot an excellent alignment and you will be able to tell this after your first walk. It is also beneficial for your foot that they could be tightening around your foot and they provide a small support for your ankle as well. The heel is also an important part of a hiking shoe. The Men’s Chaso Yampa sandal heel is made with high tensile heel riser, which is also adjustable and very durable. They are also very lightweight, which is extremely important, especially if you are hiking on hard terrains where every pond matters. Its only downside is the toe strap is quite tight and it might be a while to get used to it. However, if you have used these kinds of shoes before they will be very comfortable for you. The toe straps also take some breaking in, so keep in mind that you should wear them on a short trip first if you want to feel comfortable for the longer one. However, that same toe strap offers stability to the stepping and security to the whole foot. Related: Consider the Mosquito Guard BLFWX Repellent Spray as you need to keep your feet and legs from nasty bug bites! When wearing sandals, you might be more apt to getting bitten by bugs. Keep those legs and feet safe! Description: These Adidas Adissage Sandal are made of synthetic materials. However, this time, Adidas has focused on their design and practical features, rather than the materials used in the manufacturing process. The sole is synthetic and they are able to be customized to your foot. The customization is pretty comfortable since there are some people with wider or thinner feet. These sandals are the perfect choice for them since they will keep their foot tight. The Adidas logo and the straps are of course included in the design. As noticeable from their design, they are suitable for summer weather only since they are open from every side so your foot is able to breathe freely. What makes this sandal special is the pod lined footbed with is also massaging your foot while you are walking. This is known to improve the circulation and it is positively influencing every organ since all the nerve endings are on that part of the foot. As for those users who prefer comfortableness over health, they will also be satisfied with this Adidas design. They are an excellent choice for pool shoes or the beach because of their synthetic materials. They provide them an easy drying and you wouldn’t have to wait for more than 5 minutes for them to dry completely. Because of their material, they are also very good for using them on public showers since they could help avoid the fungus and bacteria which are very common in these places. Their only downside is that if you haven’t worn these kinds of shoes before, which come with a massage cushioning, you might take some getting used to. After a while though, you wouldn’t want to exchange them for any other pair of sandals. It is slightly probable that your strap could get loose after years of wearing them if you tend to tighten them as much as possible. Related: If you are going outdoors and need some good headphones, the Panasonic RP-HJE125-A Earphones are under $10 and give you exactly what you need in a good pair of buds. Having good sandals and good tunes will make your outdoor experience more fun! Specific features: Spider rubber outsole, rubber sole, odor resistant treatment, shock absorption technology. 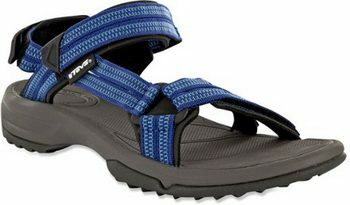 Description: These Teva Terra Fi Lite Sandal are the perfect combination of a pool sandal and a hiking shoe. They are perfect for high temperatures when your feet need a lot of breathability, but still remain the supportive properties. 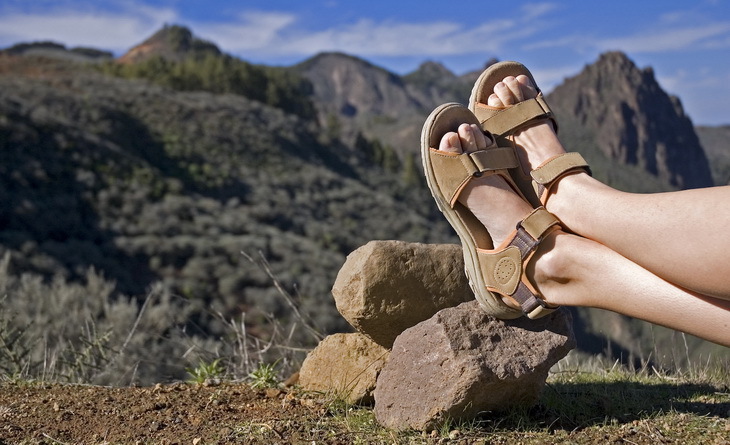 They are very comfortable and their design is made for long hikes and new adventures. The outside of the sandals is covered with a spider rubber outsole which makes their design better and it provides a better traction and durability. 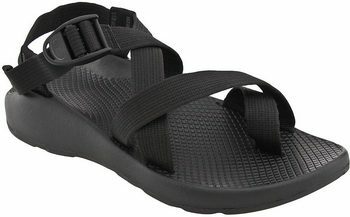 To start from the top the closures these Teva sandals use are hook and loop which is very comfortable and easy to use. After a while they are starting to loosen up, but the closure part could be easily fixed. The sole is made of rubber and it has a downward design, which means that the heel is a bit higher than the toes. The heel measures around 1” which is good for softer terrains such as grass and ground. However, if you are planning on hiking on a rockier terrain, make sure you check our other suggestions with a higher heel model. The platform measures around 0, 75” which adds to the comfort. 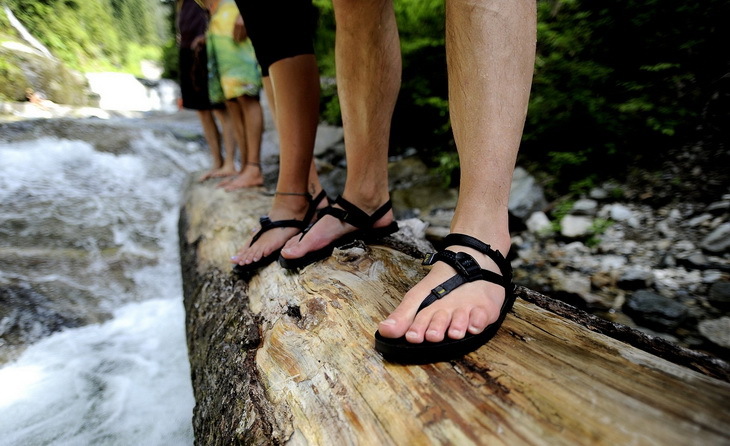 Teva Terra Fi Lite sandals use EVA midsole which make the sandals very lightweight and well supported. With this height of the shoe, the shock absorption is usually lower than the higher ones. However, Teva Terra uses a shock absorbing pad technology, which will make your running more comfortable as well. Even though, most sandals that are open are less subjected to bacteria since the foot is able to breathe properly and the humidity on the foot is lower, some people who sweat more should also consider this fact. These sandals are treated with an odor resistant treatment with a zinc based chemical which prevents your feet from smelling, regardless of how much you are sweating. Related: The Under Armour Raid Shorts are comfortable shorts for nice days when you want to wear casual clothing with your sandals. Users say they fit comfortable just like these sandals, so they make a great match when you just need to relax outside! 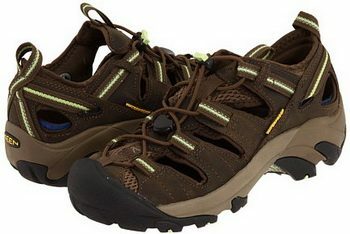 Description: These Merrell Kahuna III Sandals are indeed the most fashionable design out there. They are beautifully designed on the top of their great quality. The upper part is made from leather material which provides a great comfort and it is very pleasant to the skin. Because of the difference in the feet wideness Merrell has made customizable sandals, which are adjusted with hook and loop closures. Since the system is put on the top of the leather material, they could be used even if it starts to loosen up. However, no user has reported such issue. 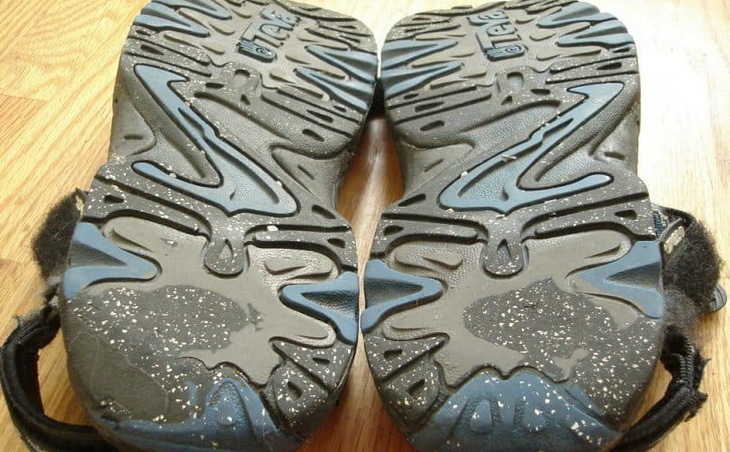 The sole is made of a combination of gum rubber. The closure on the ankle part is made with speed laces which is a nice combination with the hook and loop system. By using them you might find out which one you prefer. However, each closure system is recommended for different parts of the foot and Mirrell has designed this very well, from a practical point of view. The lining in made of Neoprene material which providing a padded comfort. As a bonus feature, the sandals are treated with antimicrobial solution which makes them less subjected to keeping smell. However, the leather is a material which easily absorbs smells and for this reason, the odor resistant treatment is more of a necessity than an additional feature. After a while, the antimicrobial solution is starting to wear off and you would have to repeat the process or your feet might smell a bit. The heel is made with a TPU heel stability arm, which will provide the user with stability especially on rough and uneven terrains. It also has included a Merrell air cushion in the heel which absorbs the shock of running or walking and adds to the stability and security of the foot. If you have ever used a Merrell shoe before, then you know how comfortable the cushions and support are. Related: Merrell makes comfortable shorts you can wear with your sandals! The Merrell Belay Shorts are made of nylon and are low profile, just like these sandals. Wear the two together for maximum comfort outside! Description: These Under Armour Ignite Slides are made from synthetic material, which makes them suitable for pools and beach walking. They are drying very fast which makes it hard for bacteria and viruses to stay on your feet and cause a fungus infection. They are basically designed as a slip on slide sandal intended for everyday use in warm weather conditions. Even though it is not noticeable from the photos provided through the link, they are designed with an adjustable strap which makes it easy for you to customize the size to your own foot. This makes these sandals extra comfortable. The footbed is made of two-layer, 4D foam, which is making the cushioning comfortable for staying in them the whole day. It only takes one walk to get used to them and use them through the whole summer. The strap however, is covered with a Heat Gear fabric lining which is making the drying process a bit slower than the synthetic only sandals. However, it does make them more comfortable than competitive models and more pleasant to touch. They contain EVA outsole combined with traction pods which is the most lightweight outsole on the market. This makes them perfect for hiking or walking on the beach. Their biggest downside is their price which is a bit too much if you are planning on using them as beach sandals. However, once you try them on and assure yourself of their quality, you would understand the cost. Although the materials used are very comfortable and high quality, they also tend to collect a lot of humidity inside, therefore, they start getting a smell after a while. However, if you manage to keep the memory foam from damage, they will collect less sweat and you can partly avoid this problem. 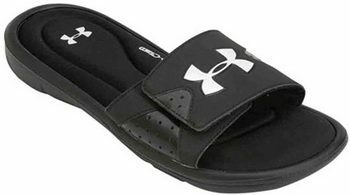 Related: Under Armour makes many products that would work well with your new sandals. The Under Armour Tech Shirt is made of polyester and is quick drying, too! With this combination, you will not have to worry about being wet for too long! Description: These Teva Omnium Sandal are the perfect combination of textile and synthetic material. They are partly closed which provides the user a great protection from the outside influences. 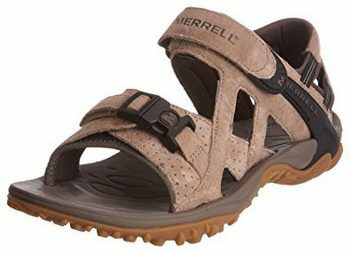 These are sandals made specifically for hiking in summer. Their design is made with a closed toe box, for additional protection, yet they have enough openings so that the foot can breathe and release excess moisture. The closure system, is pull cord lacings, which is great for this design of shoes. The lacing system is also enforced with a quick buckle mechanism which is located near the ankle. Considering the fact that these are mostly closed sandals with little breathability spaces all across the shoe, it is a good idea that they are treated with antimicrobial solution. The Zinc based odor resistant treatment is killing the bacteria from the sweat, thus preventing them from stay in the inside of the sandal and have an unpleasant smell. 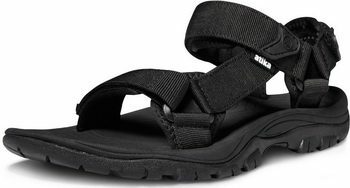 These sandals also have a shock absorbing technology, which is called Shock Pad as you might have encountered in some of the other sandal models. There is also a spider rubber outsole which is making the sandals more durable and it provides better traction. The rubber outsole is perfect for hiking on slippery terrains since they are keeping you stable and safe. The only downside would be that they are too closed, so you might get too hot inside. So, if you are a hot-feet person, it might be better to look at our other suggestions. Related: If you are going to be on a long outdoor hike or camping, the Eagle Creek 1129050 Pocket will help keep some of your smaller items stored safely as you enjoy the outdoors in minimal wear, like shorts and sandals! Description: These Atika Maya Trail Sandals are known for their design and their usage in water. They are mostly intended as non-slippery sandals which you can use by the pool or on the beach, but you can also go ahead and walk on the waves, since they don’t mind the water at all. They definitely made for summer weather conditions since they are almost entirely open. They have a rubber sole as most summer sandals, which is ergonomically designed to the shape of the foot, so you can feel more comfortable while standing or walking for a longer period of time. They also provide the user with an arch support and they have integrated a very comfortable cushioned insole. If the comfort of the shoe comes from the insole, this is the one you should choose. They have an interesting feature which is called 3D mold. It is the name of the contoured foot bed which fits loosely in the bottom of the foot. The straps are water friendly, which means that they dry easily. They are also adjustable to your own foot shape and they could be tightened as much as you like. We even recommend that you tighten up if you are planning on going into the water with them. Their only downside is their stated size. The size chart is a bit off, so in case you decide on buying these sandals, make sure you order a size smaller because they are huge. If you have small or thin feet, it might be a good idea to look through our other sandal suggestions. Related: If you are going to be near water, consider getting the Onyx MoveVent Life Vest as it will keep you afloat! 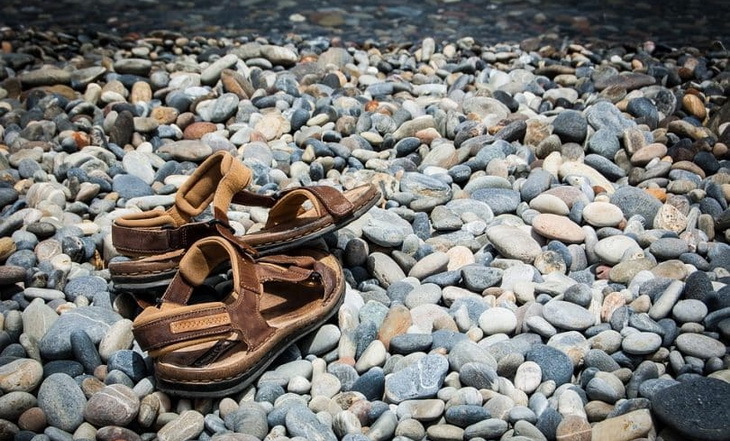 You will want to wear your sandals near the water, so be safe with a life vest, too! That is all for now. Keep in mind that this season, there are many brands of shoes, bringing to the market some interesting models to choose from. They all have interesting features which and it is difficult to choose the most convenient one. For this reason, make sure you read our sandal suggestion list since it contains the best from the best summer hiking sandals. We cave carefully reviewed and rated every product on the list and provided you with the information you need in order to choose your best sport sandals and finalize your purchase. However, the main leading pointers should always be your personal preferences. This way, you will be content with your choice and hopefully you will spend many summers wearing them. If after reading this buying guide you have additional question, feel free to leave us a comment in the comment section below. Or maybe you would like to share a sandal experience with us. We are always happy to hear our readers’ stories and more than willing to provide answers to your questions! Prepare for the summer everyone!